The leftmost column of pixels of the "full" arrow in the furnace GUI is always drawn over the "empty" arrow. 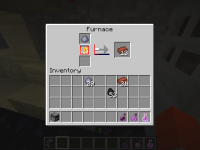 With default textures, you don't see this because the leftmost column of pixels is the same colour with both arrows. The bottommost row of pixels on the "full" arrow is also never drawn. Though a small issue, it can be slightly misleading for people making texture packs, as they'd expect the full graphic to be drawn when smelting, and none of it to be drawn when dormant. 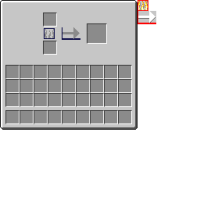 Included is a simple test texture pack to demonstrate this. With the "full" arrow, I've drawn red over the leftmost column of pixels, and over the bottom two rows of pixels. The same is done with the "empty" arrow, but with a dark blue. The leftmost column of pixels is always red, while the bottommost row is always dark blue. I've also drawn boxes around the "full" and "empty" flame graphics, coloured red and dark blue respectfully. I've noticed the entire "full" flame graphic is only drawn for a moment, before the topmost row of pixels is shaved off. I've also noticed the bottom two rows of pixels of the "full" graphic are drawn during the last stage of its animation; the bottommost row of pixels is never drawn by itself. Once again, this can be slightly misleading for texture pack makers.